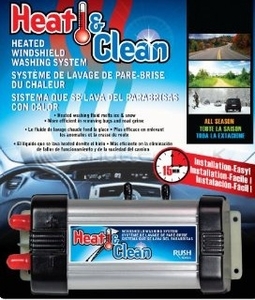 Heats washer fluid to 157 degree Fahrenheit in 8 to 10 seconds to melt frost, and snow from the front window of any vehicle. Average installation is 15 minutes and can be mounted on any vehicle by connecting the unit to the battery and the washer fluid hose. Mounted in any direction this unit can be tucked into any hole as long as it is mounted closest to the nozzles as possible. Operates via micro switch, when the units senses fluid flow the unit activates eliminating the need to mount any switches within the vehicle. After the unit heats up fluid it turns back off until flow is sensed again, thus eliminating constant current draw. One year warranty to end user with proof of purchase. Will not damage a window that has an existing stone chip. The only true DIY system that is not application driven and installs easily in 15 minutes or less. Installs between washer fluid reservoir and fluid nozzles.